Will never be damaged by moisture or mold. Protects carpeting and other finished flooring from slab moisture. Integral thermal break makes finished floor surface warmer than concrete. Built-in drainage plane to avoid trapping water. Installs without adhesive or fasteners. Low-profile to maintain maximum headroom in the basement. ThermalDry® Floor Matting is only available from a certified installer in your area. Contact us to request an inspection & get a free cost estimate to have it installed in your home. Indestructible underlayment. 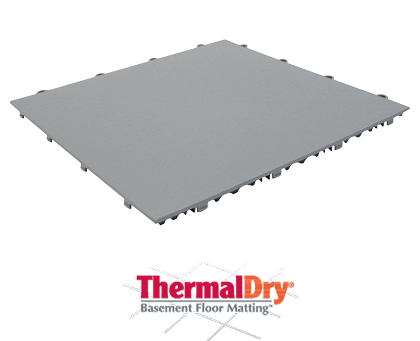 ThermalDry® Floor Matting comes in the form of square tiles that interlock. Use this system to create a subfloor that's strong, totally waterproof and ready for carpeting or other finished flooring. The flooring in a finished basement is likely to be one of your important (and costly) improvements. That’s why it’s smart NOT to install a wood subfloor beneath carpeting or other finished flooring. Wood and foam carpet padding will absorb moisture from the slab and other sources, attracting mold, dust mites and wood rot. Bad odors, rotting underlayment and unhealthy mold spores will force you to tear out these unsuitable materials –a costly and messy operation. Fortunately, you can avoid basement flooring failures by installing ThermalDry® Basement Floor Matting. These innovative subfloor tiles are made entirely from reinforced plastic, so they won’t ever absorb moisture or attract mold. In fact, the ThermalDry® underlayment system creates a moisture and thermal barrier to keep your finished flooring dry and comfortable –at least 8 – 10 degrees warmer than the concrete surface. ThermalDry® tiles also have a built-in drainage plane that allows condensation and other moisture to remain isolated from your finished flooring. ThermalDry® Floor Matting is a permanent subfloor system, not a temporary installation like wood underlayment. It’s the best and last subfloor your finished basement will ever need.